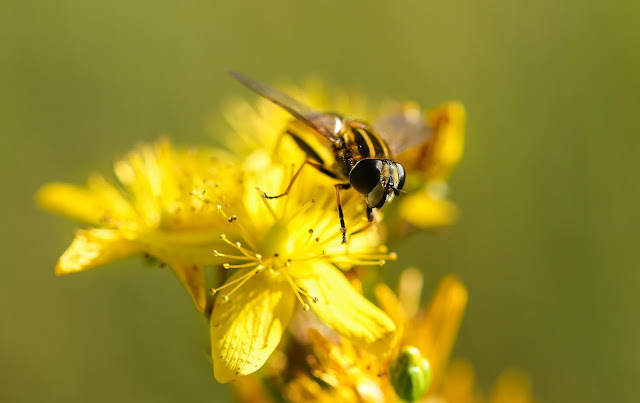 The June Art Elements theme challenge is to create something (it could be beads, jewelry, art, etc…) inspired by insects. Any medium can be used. It doesn't even have to be an accurate representation of an insect either. It can be something inspired by one. I decided to showcase the ladybug. Living in Delaware I am extra aware of the ladybug. It was adopted as the official state bug of Delaware on April 25, 1974 thanks to an intensive effort made by Mrs. Mollie Brown-Rust and her 2nd grade students of Lulu M. Ross Elementary School in Milford, Delaware. Children love ladybugs. Coccinellids are known as ladybugs in North America, and ladybirds in Britain and other parts of the English-speaking world. 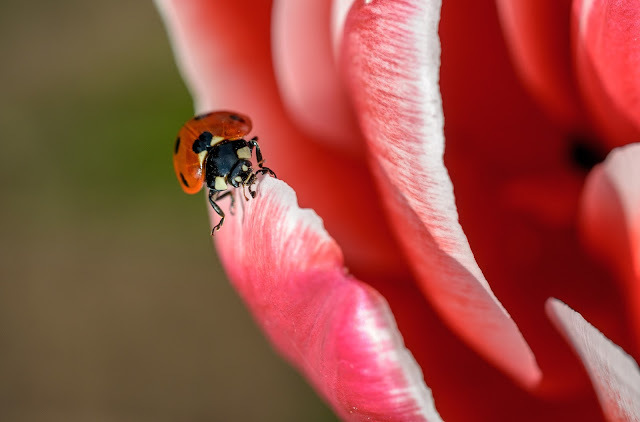 The majority of coccinellid species are generally considered useful insects, because many species prey on herbivorous such as or scale insects, which are agricultural pests. I was thrilled to be able to snag these lady bug ceramics made by Scottish artisan Grubbi. These lady bug earrings have yellow, white, and black Czech beads threaded onto blackened steel wire that is attached to the black ear wires. This casual insect jewelry is perfect for the summer. 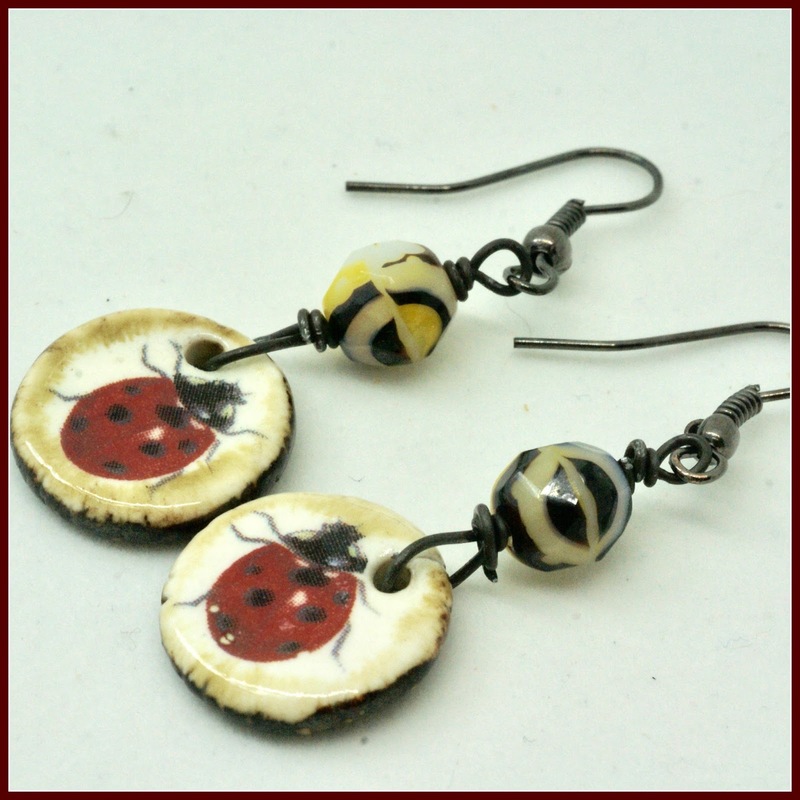 The lady bug earrings are available for purchase. I shared one of my favorite insects. I am anxious to see what others have been inspired to create on the June Art Elements theme challenge . I get lots of inspirations for my jewelry designs from nature. I recently ran across an online guide to Yellowstone National Park that made me think back on a couple of recent trips there. One of the highlights of the park are the geysers. Yellowstone National Park offers visitors a unique perspective of the geothermal activity going on just below the earth´s crust. There aren´t many places in our world where you can go and say that you were walking around the mouth of a super volcano ready to erupt at any moment. This guide has some breath taking images of them. Another reason, folks go to Yelllowstone is to see the wildlife there. Yellowstone has herds of bison, elk and pronghorn and one of the best places in the lower 48 states to see a grizzly bear. This guide also has some great photos of the wildlife there. I wish I had run across this guide before my trips there because it offers some really good tips on places to go there and things to see. In a previous blog, I talked about a few pairs of earrings that were inspired by my first trip to Yellowstone and I included a few photos of the geysers that served as the inspiration. On my second trip there last year, we camped in the northern part of the park where you can find lots of wildlife. 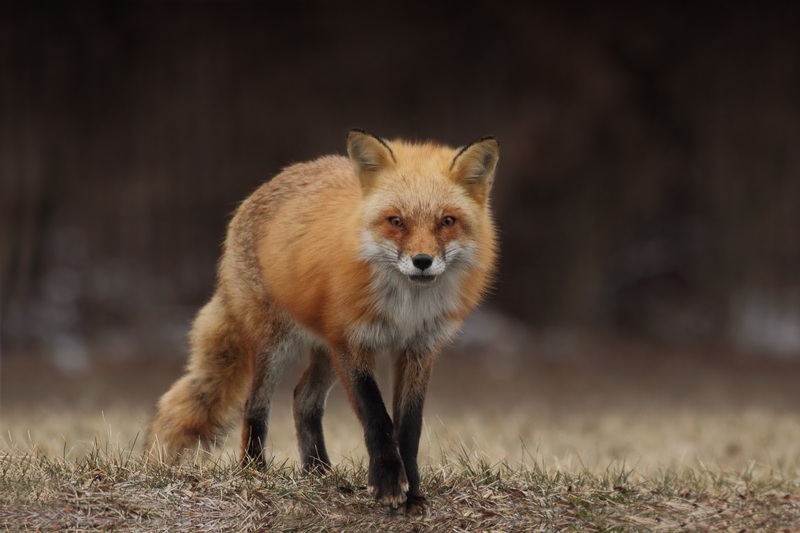 Early one morning, I spotted a fox crossing a creek and I was very close to it. They are widespread throughout the northern part of the park with somewhat patchy distribution elsewhere in the park. Of course, I got so excited I blew all of my photos of him. 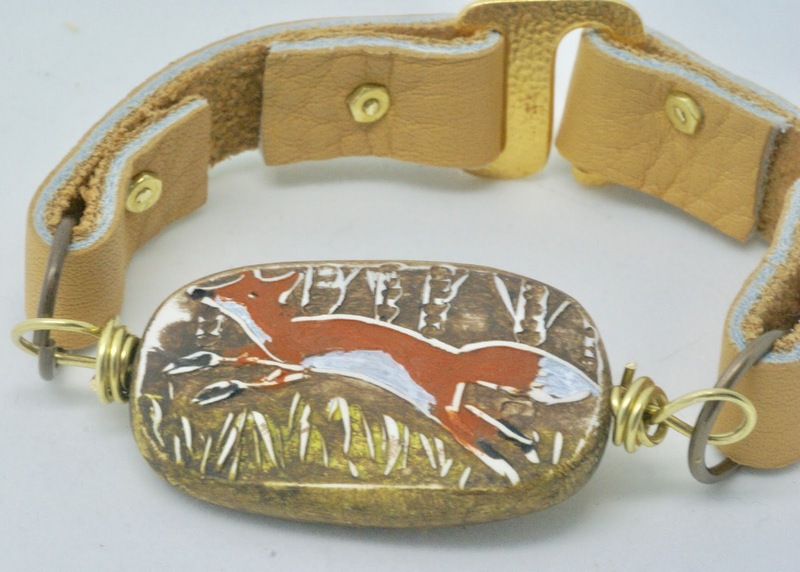 But I was so close to the fox that the sighting was one of the highlights of the trip there and the memory has stayed with me and inspired me to create a couple of bracelets with the red fox serving as the centerpiece. 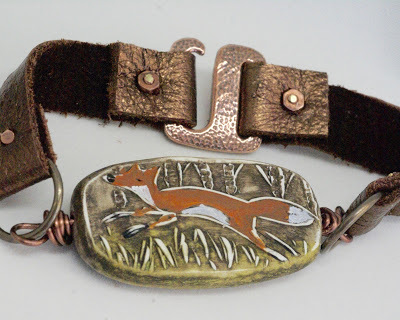 Around the same time I read the Leather Bracelet with Micro Screws Nuts Tutorial by Powers of Humblebeads on her blog and I decided to give it a try while working with her fox component. A real plus in this tutorial is that it lists component and where to locate them. It also has great directions with photos. I did deviate from the tutorial slightly when I used her fox component. It didn't have holes on each end like the bracelet bar in the tutorial. I had to create a loop and connect it to the jump ring and leave enough room to make a messy wrap next to the component. I then ran the wire horizontally through the component and make another loop. I used this loop to attach to the jump ring. Once again I left enough room to make a messy wrap next to the component. Now, that I made the bracelet I have mastered a new skill. Micro screws and nuts make this a no-fail project with very minimal tools and no riveting experience needed! In fact, I had the tools. I just needed to get the leather, E hook clasp, jump rings, micro screw and nuts from Lima Beadshttp://www.limabeads.com/. My first fox bracelet was gifted to my daughter who loves in Atlanta. She has foxes that live in her neighborhood. She really enjoys watching them so I knew she would love the fox bracelet. My second trip to Yellowstone made me want to make another fox bracelet. Knowing Heather makes darling fox components I decided to purchase another fox. This time I used the same directions but different metals to accentuate the tan leather I choose. I selected brass instead of copper. Which bracelet is your favorite--copper or brass? The June We're All Ears challenge is to create earrings inspired by fireflies. Some of my fondest childhood memories involve what we called lightening bugs. Actually, these magical creatures are neither bug or fly, but in fact they are beetles. Many a night I enjoyed carefully watching these bugs put on a spectacular show in my backyard. Fireflies are found all over the world, from the Americas to Europe and Asia. In the United States, they are commonly found down South, in the Midwest, and on the East coast. Having lived on the East coast all of my life, I had lots of opportunities to view them on a warm summer evening. I also enjoyed catching them. The best time to catch fireflies is typically between June and September. They tend to come out at dusk when it is still warm out. Since I grew up in the suburbs, I was in a prime viewing location. Since they rely on their light patterns for mating, fireflies are more attracted to darkness so you need to wait for the sun to go down. Back when I was growing up, there were a lot less lights. Now, you probably need to turn off your outdoor lighting, such as porch lights and walkway lights, to draw in more fireflies. They are fairly easy to catch if you approach them slowly and calmly. Once you are close enough to a firefly, reach out with both hands, and try to cup the firefly between your hands. Keep your movements slow and gentle so that you do not scare or harm the fireflies. If you plan on keeping the fireflies that you have caught, put them in a glass jar so that you can see their light. Mason jars are popular jars to store fireflies in. Most people end up putting their caught fireflies into mason jars, so you can skip a step by catching your fireflies in a mason jar. Move slowly and calmly as you move your mason jar through the air to catch fireflies. Once a firefly has flown into the opening of your jar, place the lid on top to keep the firefly inside. Do not poke any holes in the jar, as this could dry out the air and possibly cause the firefly to get injured while trying to escape. Remember that fireflies like humid, damp spaces. It is a good idea to put grass inside the jar. Although it can be tempting to keep fireflies for a long time, it's best to let them go after a short while. 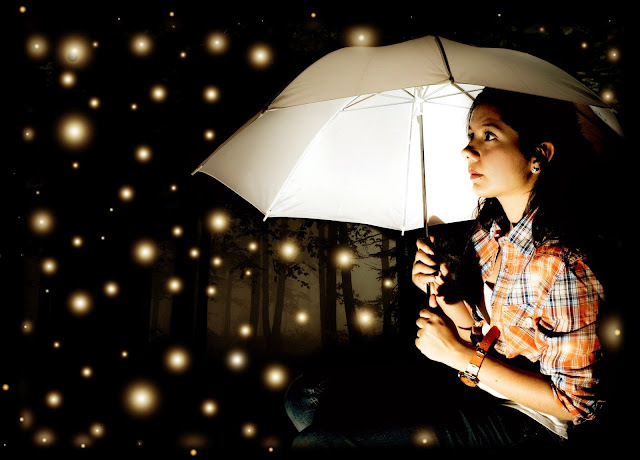 Ideally, you should free your fireflies before going to bed. If you keep them overnight, be sure to release them the following morning. They need to be in their natural habitat in order to survive, and keeping them in a jar for longer than a day can cause them to die. When I had my own children, I shared this experience with them and I got to relive this fun summer activity. If you haven't spent time watching fireflies, you have missed out on a great experience, so go and do it! These yellow and honey brown filigree dangle earrings are inspired by the firefly. 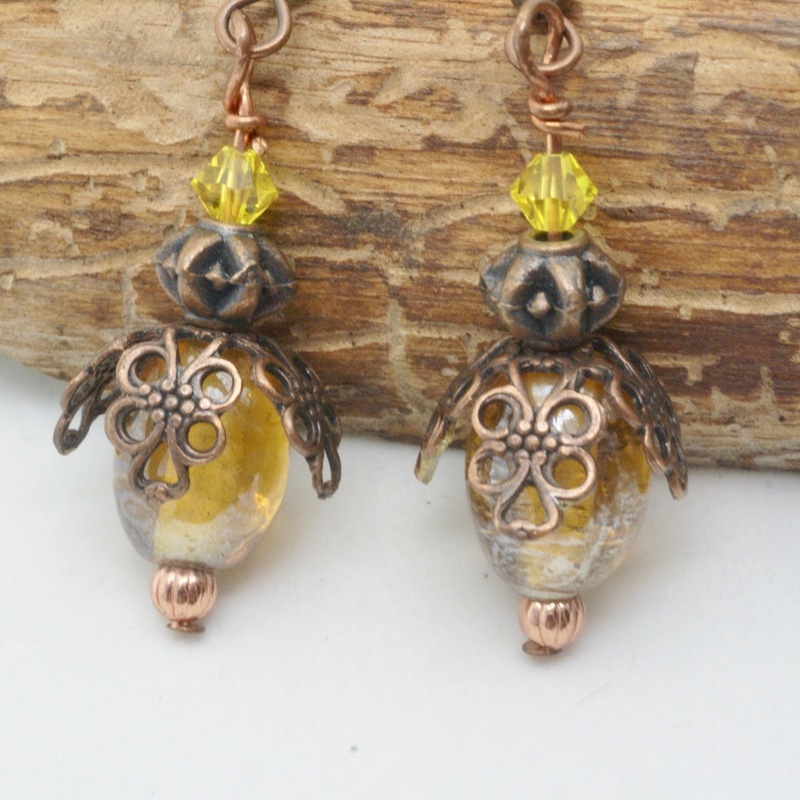 To make this firefly jewelry I used some antique copper filigree and combined shinny copper elements with some golden glass beads and bright yellow Swarovski crystals. 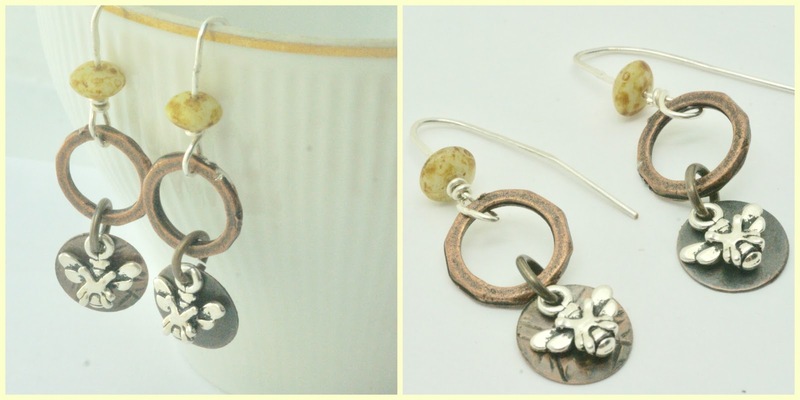 My other pair of firefly earrings are sterling silver ear wires that are hand forged and hammered copper discs by me. I added hand forged copper rings and little silver charms. The copper earrings are about 2 inches long. Don't you just love fireflies? 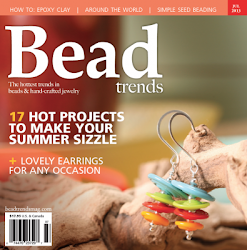 Profile On Red Meanders is this month's inspiration piece for Art Bead Scene Challenge. 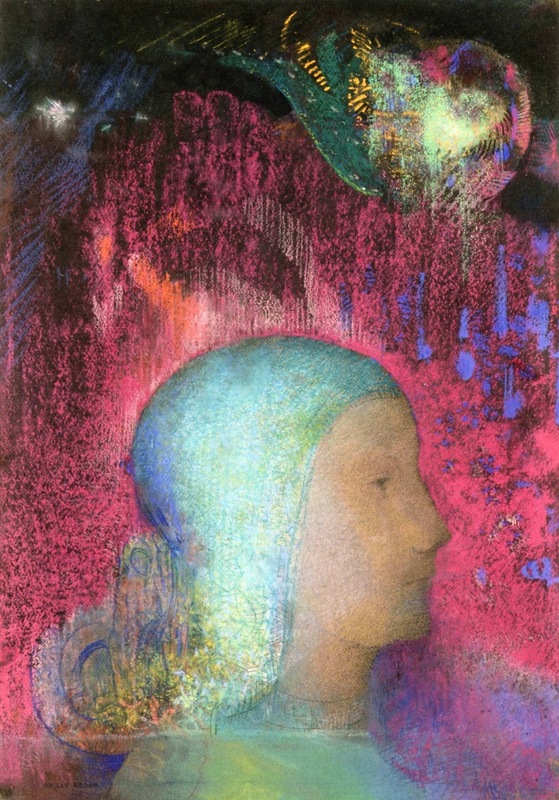 It is a stunning pastel drawing Redon exhibited in 1903. It is a female head that stands out against an intensely red background, streaked with blues, greens, magenta colors. In the upper part, there is a kind of star on the left. Notice the orange, green, red and blue patches on the right, grouped together to form a nautilus shape. It can be interpreted as a night sky, fireworks, or phosphenes. It can also be thought to show the figure's inner mental space. During his early years as an artist, Redon's works were described as "a synthesis of nightmares and dreams", as they contained dark, fantastical figures from the artist's own imagination. His work represents an exploration of his internal feelings and psyche. There are so many colors in the art piece that it is hard to select just a few of the colors to work with. I love blue so I went with some of the blues. 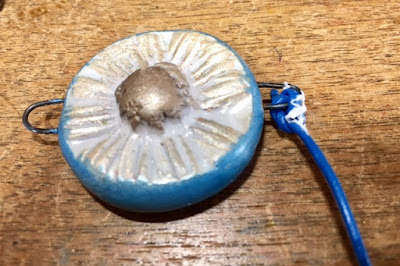 I used a polymer clay bead by Brooke Bock because of the blues and grays in it. In order to assemble my necklace I needed to tie leather cord to the focal. 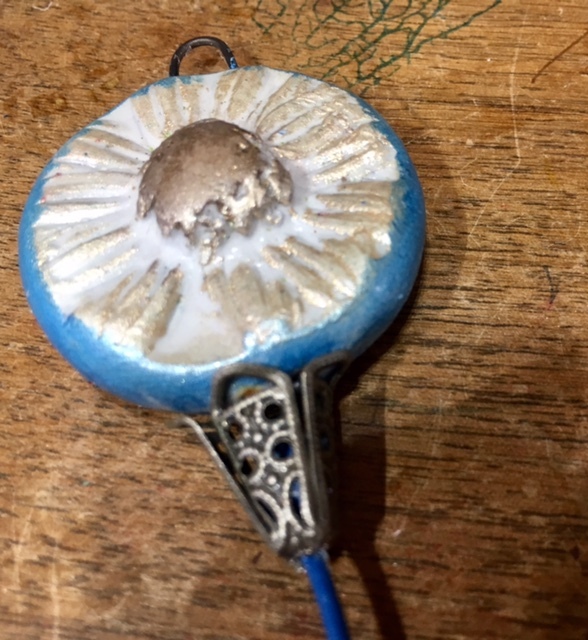 I was not too fond of having the wires on the focal show because the would give what I planned as a contemporary necklace a rustic look so I came up a plan to disguise them. I took some gray filigree end caps and curled their ends up to sit against the focal. Since the filigree beads were gray they had the aded advantage of adding more gray from the art work to the necklace. I cut the beautiful royal blue leather that I bought for this necklace, attached it to the wire by knotting it and putting a dab of glue just on the knot to make sure the knot stays. 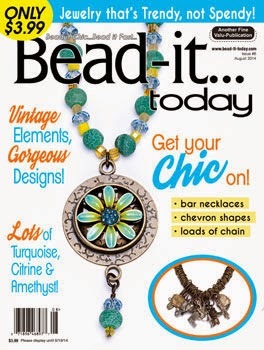 This multicolored casual necklace is made from upcycled vintage tin beads. 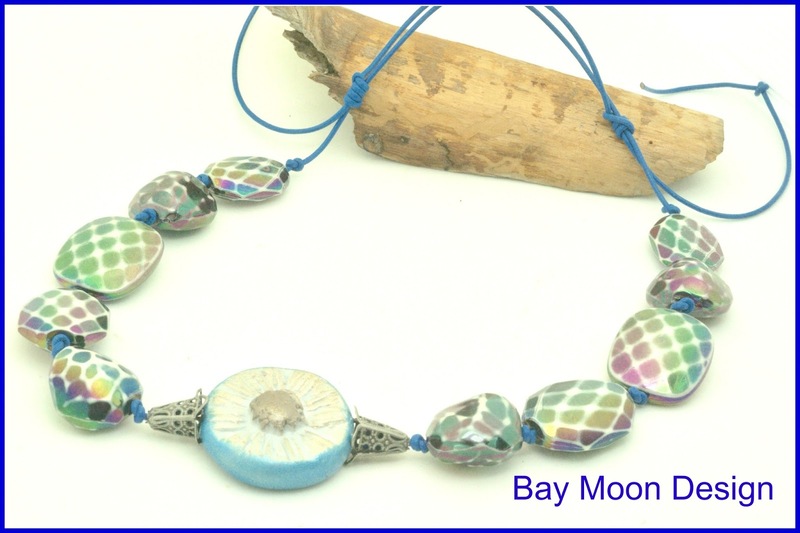 When I saw these chunky recycled tin beads, I knew they would make a fun necklace . They even have a mauve pop of color along with a variety of blues and blacks. The large beads go well with the large floral focal. All the parts are combined by knotting royal blue leather. I finished the necklace with an adjustable knot so the necklace can be worn as a choker or short necklace. In addition to using a number of the colors in the painting I feel that the colors of the necklace also show the theme of triumph of light over darkness. What are your thoughts? 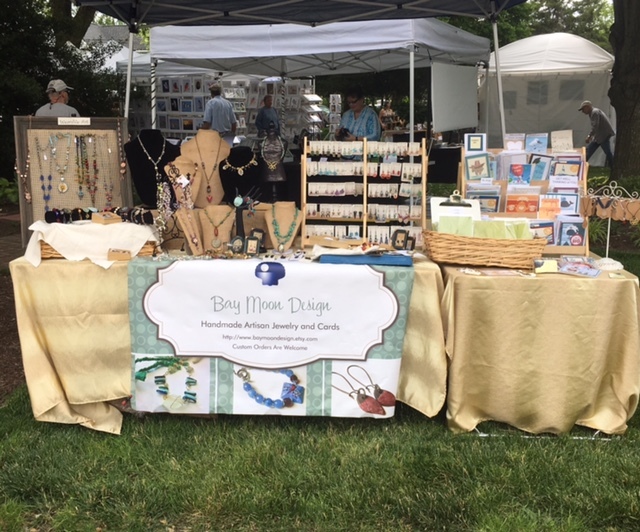 Over Memorial Day weekend I participated in a members of the Delaware by Hand Artisans Fine Arts and Craft show. It was a held outside on the grounds of the Zwaanendael Museum in Lewes, Delaware. The show seemed to be heavily attended. I heard that my small town had 3,000 people at the Farmer's Market that day! I thought I would show you a few of the vendors that were there this year. 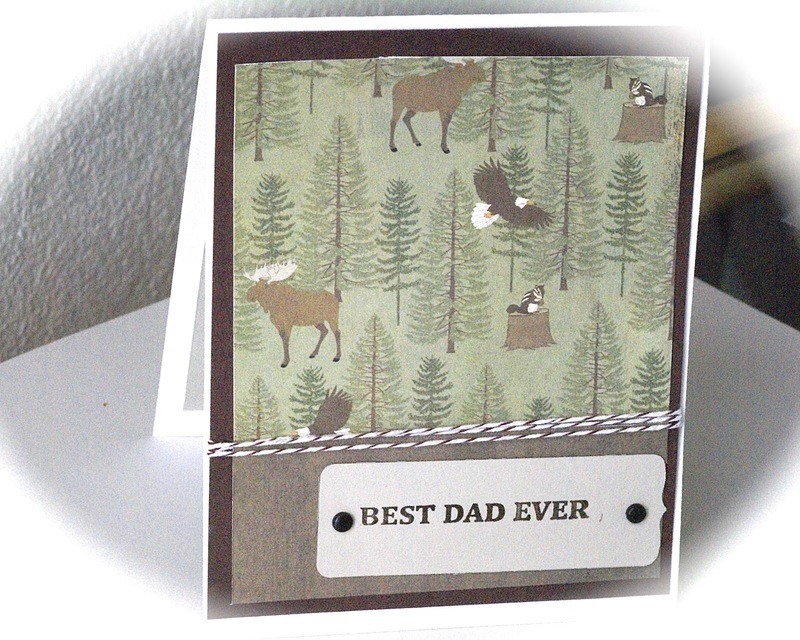 On one side of me had 2nd Time Designs. You can tour their private gardens in Millsboro, Delaware to see more of their designs. Every year I admire their metal art that they bring to this show. Who won't want one of these sculptures in their garden? This year I had a chance to chat with the folks. Since I am starting to work more with metal in my jewelry, I am familiar with how difficult it can be to cut and punch metal. At first, I thought that is what these folks did to create these beauties. I am sure that some cutting and punching goes into these designs, however, what these artisans are doing is recycling metal. I am sure that they have a grand time hunting down metal shapes that they can use to create flowers, insects etc. If you look closely at the bottom of this photo, you will spot a metal turtle that almost blends into the ground. The shell of the turtle is a repurposed helmet. How cute is that? The large flowers had some sort of a wheel on the back. I am a huge fan of recycling and repurposing so I was happy to see all of the metal turned into beautiful creations and not in the landfill. My neighbor of the other side was Michael Ortiz of Limited Landscapes. He specializes in taking photos of Southern Delaware. I love the photo of an old barn which is no longer here. He was able to frame it with some of the wood from the barn. Once again, some art from repurposing. I enjoyed looking through his photography. 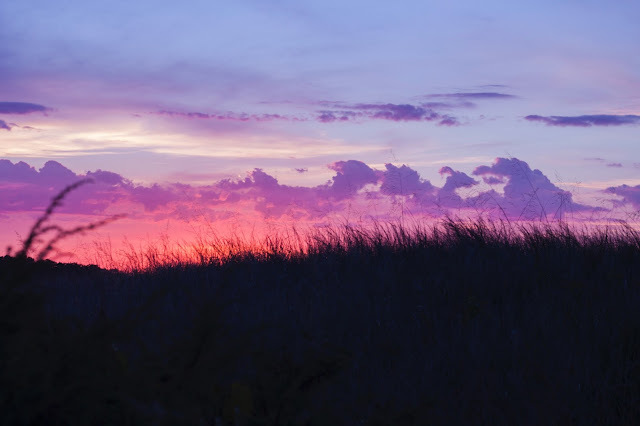 I saw some scenes that I was familiar with from nearby Cape Henlopen State Park as well as some areas I have not traveled in Southern Delaware. All beautiful! In addition to being a wonderful photographer, Michael is a really nice person to do a show with. He introduced himself and gave a big welcoming smile when I started to set up that morning. If you do a number of craft shows, you have probably encountered some grouchy and territorial neighbor vendors. I know I have run into a few. Michael is not that type--a real gentleman. The weather forecast for this show called for a chance of rain in the afternoon. My husband who I could not do a show without his physical help, offered to set up our tent. I was thrilled and surprised. The last time we set that tent up it was a battle. He purchased this particular tent because it was easy to pop up. That wasn't the case then or for the show. I had to ask Michael for a hand with it or we wound never have gotten it set up. He was only to happy to help. Since then we have replaced the directions which came with the tent with some others we found on the Internet that enable you to actually have an easy to pop up tent. A few spots down from me I recognized a familiar face from Lewes--Connie Ballato of Sun Glass Studio. Her stunning creations can be found in area churches, homes, gardens, and offices. I bought a large stained glass fish for my husband for our 30th wedding anniversary which was more than 15 years ago. It has hung in our family room every year since then. After every show I usually blog about some of the artisans that I have met and offer some lessons learned. My lesson this year was using a tent is a good idea now that I have some better directions. I didn't have to worry about the weather and it offered protection from the sun. All good! In case you are wondering, the rain came just as the show ended. My other lesson learned is that is actually a good idea to pay more for a prime spot at a show. I had a terrific spot part of which was just luck and it paid off in sales. Next year I am going to be willing to pay more and go for location, location! 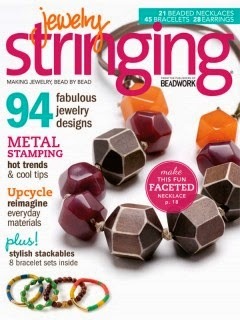 I do have some jewelry and handmade cards left from this show and they are listed in my online BayMoonDesign shop. 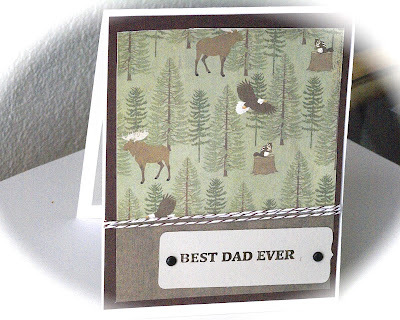 If you need a unique Father's Day card, visit my shop. I also have handmade jewelry available. Lots of my jewelry is nature or yoga related. This lotus flower necklace combines both of my loves--yoga and nature. 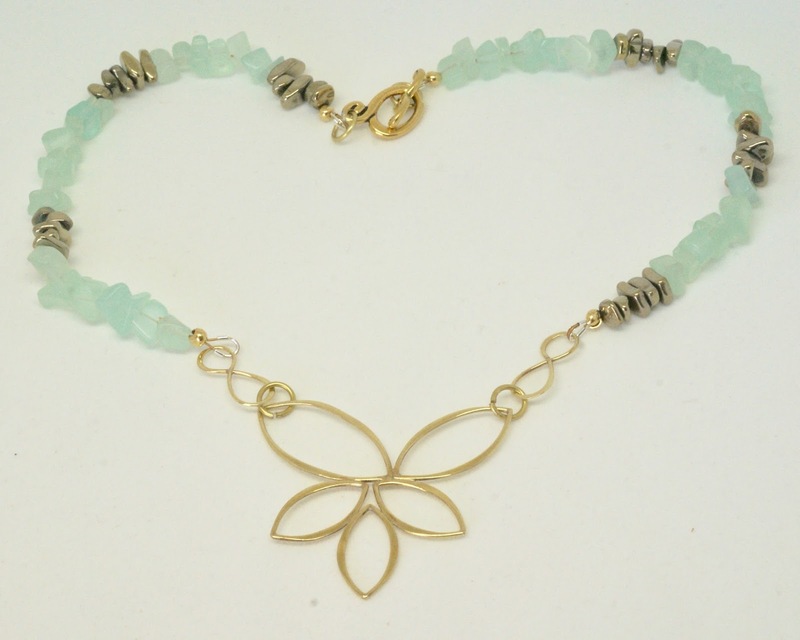 The necklace has a large, gold colored bronze lotus flower pendant. The aqua necklace also has two infinity symbols. 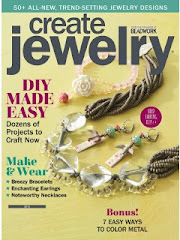 I paired the bronze pieces with a aqua beads to create this pastel floral necklace which is 17 inches around. I selected a lotus flower because it is one of the most delicate and beautiful flowers. Although lotus grows in muddy water, it grows beautiful and brings a smile on anyone's face who sees it. The Lotus has long been associated with purity, rebirth and beauty. I paired it with infinity symbols because of the shape is classic, fluid, and romantic all at the same time. Think love, for it is infinite, boundless, and everywhere. I think that this would make a beautiful anniversary gift.